A group of scientists from Tohoku University, Japan experimentally demonstrated the hydrogen spillover effect of buckyball (a.k.a. fullerene or C60). They achieved this breakthrough using mass spectroscopy, and their findings were published recently in Chem. Commun. Certain transition metal nanoparticles (e.g. Ru, Pt and Ni) can capture hydrogen molecules. The capture process generally involves three sequential steps. Firstly, hydrogen molecules split into hydrogen atoms on the metal surface. Secondly, the yielded hydrogen atoms migrate on the surface towards substrates under the metal nanoparticles and, finally, these atoms fix onto the substrates. The second step is termed the “spillover effect” (Figure 1a). Previous studies predicted that curved graphene sheets could enhance the hydrogen spillover effect at ambient temperatures, but solid experimental evidence has remained inadequate. To gather evidence for this prediction, Nishihara et al. studied the material buckyball, a spherical carbon nanosphere that represents an extremely curved graphene sheet. 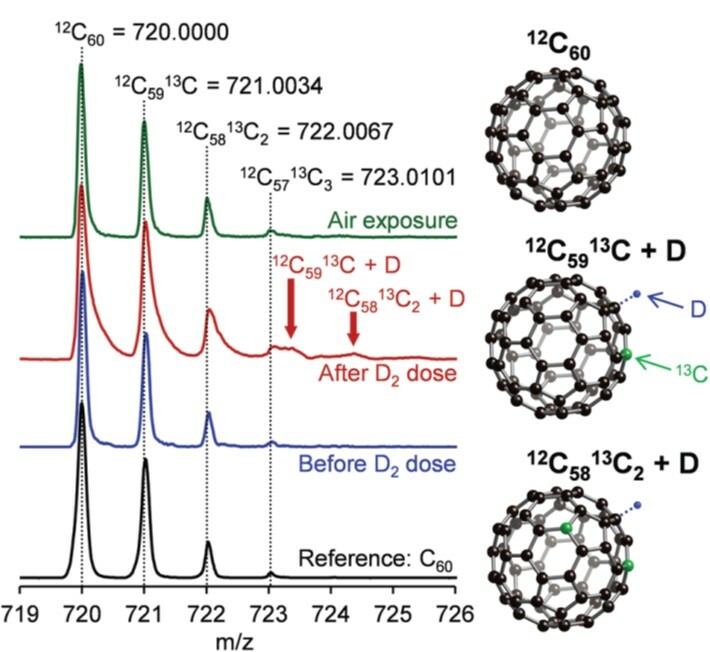 The researchers selected ketjenblack (KB), a type of porous carbon sheet, as the substrate, and deposited Pt nanoparticles (1-3 nm in diameter) and buckyball molecules onto it (Figure 1b). They found that the Pt and buckyball-decorated KB stored a higher amount of hydrogen compared to the Pt-loaded KB. This observation indirectly confirmed the previous prediction, as hydrogen storage capacity may be improved by enhancing the spillover effect. Figure 1. (a) A schematic illustration showing how a hydrogen molecule is split on Pt surface [process (1)] followed by the spillover effect [processes (2) and (2′)]. (b) A schematic illustration of the structure of Pt and buckyball-decorated KB. The inset panel displays two forms of hydrogen bound to the composite: the physically adsorbed di-hydrogen molecules, and the spillover hydrogen atoms anchored on the KB substrate and buckyballs. The authors then sought time-of-flight mass spectroscopy to obtain more evidence. This spectroscopic technique is capable of identifying molecules with different mass to charge ratios (m/z). As shown in Figure 2, after treating the buckyball and Pt-loaded KB with deuterium molecules (D2), the spectrum (red) exhibited two additional peaks with m/z of ~723.5 and ~724.5 (highlighted by arrows in the figure) compared to those of the buckyball reference (black) and the buckyball and Pt-loaded KB prior to D2 dosage (blue). The authors ascribed these two new peaks to single D atom-adsorbed buckyballs with different amounts of carbon isotopes (12C and 13C). The presence of the two new peaks clearly showed that buckyballs could host hydrogen atoms to enhance the spillover effect. In addition, upon exposing the D-containing buckballs to air, both of the newly-merged peaks disappeared, suggesting that D atom adsorption was reversible. Figure 2. The time-of-flight mass spectroscopy spectra of buckyball (black), Pt and buckyball-decorated KB before (blue) and after (red) exposure to D2, and after exposure to air (green). Pictures on the right show the molecular structure of a buckyball molecule and two deuterium-incorporated buckyball molecules (with different number of 13C isotope). Deuterium is used to avoid the interference from the 13C isotope. This work could serve as a reference for future studies of the spillover effect induced by buckyballs interacting with other metal nanoparticles. The increasing availability of in-depth fundamental insight could refine our understanding of ambient-temperature hydrogen storage.